Having made several excellent recordings of sacred music for the Dresden Hofkapelle by Zelenka, it is only natural that the Czech ensemble Collegium 1704 and Václav Luks turn their attention to Bach’s Mass in B minor – the first half of which was presented by Bach to the Elector of Saxony in 1733. Luks provides an engaging essay on artistic choices when tackling the work; he misrepresents some small but fundamental tenets of the ‘one-voice-perpart’ theories but nonetheless balances tradition and newer thinking by adopting the principle of concertists (ie those who sing the solos and also perform in all choruses) working alongside a group of ripienists (who contribute only to the choruses). Therefore, rather than Parrott’s choir of just 10, Luks fields a vocal group of 21 (six of whom perform solos, although it also turns out that many choral passages just feature the ‘concertists’). Whether listeners care about performance practice ideologies or not, there is no mistaking Collegium 1704’s qualities: the superb choir sing with judicious weight and solemnity in the opening chords of the Kyrie, after which warmly sensual oboes and bassoons make lovely contributions to the long orchestral ritornello; once the choir re-enter, small instrumental details are sensitively enunciated. Sopranos Hana Blažíková and Sophie Harmsen combine neatly in ‘Christe eleison’, although the smooth orchestral accompaniment seems more earnest than life-affirming. There’s plenty of sparkle and vigour in the trumpet-laden opening of the Gloria and, upon reaching ‘Et in terra pax’, the oboes convey a more lilting pastoral mood than one usually hears. Helena Zemanová’s intelligent violin obbligato in the ‘Laudamus te’ perhaps seems studied rather than spontaneous, whereas there’s a looser conversational flexibility from Marián Krejčik and horn player Erwin Wieringa in the ‘Quoniam’. There is perfect balance between throbbing basso continuo line, punctuating flutes and expressive choral declamation in the ‘Crucifixus’, and the Sanctus is interpreted as a quick jig. 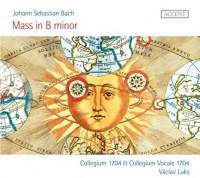 Overall, this is yet another highly accomplished Mass in B minor rather than an essential new perspective – but there’s nothing wrong with that.